Revolutionize the way you work. Really. SCG High Performance Team Trainings are not just about awareness; in our trainings, actual behavior shifts happen – and last. You want to boost an under-functioning team, build or sustain strengths – maybe address communication issues, or create a winning culture. We get it. We’re not just about flowery good ideas; we’re about actual, real-time behavior change. Teams learn High Performance not by power point or lecture, but through actual engagement in our robust, relevant simulations. Our simulation-based team building training develops the behavior and deepens the understanding that yields high functioning. There is no guess work in our work; it’s simply a vital learning context. Our facilitation gives teams the real-time tools for developing and moving forward with excellence. Entry level process for an up to 4 hour (half-day) program. Infuse ignites behavior change and thinking shifts; in just 4 hours you will see your training objectives activated. Intermediate length process for an up to 8 hour (full day) program. Engage deepens the learning process and sets the stage for sustained excellence and high performance to emerge. Comprehensive process for an up to 3-day program. Transform unlocks your team’s power; it generates the energy for enterprise-wide activation of a truly successful, high performance culture. Let’s go for easy. We can coordinate of every element of the team building process for you. Within 30 minutes, we can coordinate the experience you want, to meet your objectives. Solomon Masala | 512.293.2400 | solomon(at)sourceconsultinggroup(dot)com. Your people will think differently and behave differently after working with us and we guarantee it. We see it every time: engagement, productivity and camaraderie soar. Impeccable communication for successful, empowered action – things get done: no more finger pointing and petty drama. Leadership promoting innovation, spirited engagement, and massive productivity – respected leaders that build momentum. Honor for and integration of diverse perspectives, working styles, and cultural norms – cultures of inclusivity. Sustainable systems and strategy: total awareness of process and outcomes that support your most important resource – your people. We meet in person or via phone to listen and learn about you, your team, your needs, your objectives. Then we design for your total success. The following proven elements of excellence are built into every program. Education puts the facts in place – makes the case, readies the intellect. Training tees-up the skill development (behavior change) through use of simulations using customized simulations or a combination of custom sims with our other team building program options. Coaching assures the skills are functionally integrated and practiced in the day-to-day workplace reality. Though clients may see coaching as optional, we see even more real results take root with this step. Talk with us about our High Performance team building training today. Looking for team building in Austin and Central Texas for your small business? We’re the ones to call. We believe every team can achieve high performance. We know the commitment it requires and the massive payoff. High Performance can be the quest for excellence and maximum team effect, the ability to innovate, or the ability to deliver beyond expectations. With the right training, we believe every team can achieve high performance, now. A High Performance team is not just a concept. High Performance is a set of concrete skills available to teams who commit. The specific skills and behaviors that drive high performance (communication, collaboration, problem solving) can be learned by any team – by your team. Training gets them there. 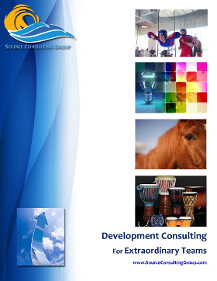 Working with Solomon and Source Consulting Group has been the greatest decision we have made with regards to creating company culture that is more connected, aligned, and in partnership with one another. Solomon has helped create a work environment and a team dynamic that allows us to move through any and all situations that arise. We simply would not be where we are today without his guidance, support, and wisdom. With so many options for team members in today’s workplace its vital to create a great company culture, don’t let your opportunity pass you by to work with Solomon and his team and become the company you have always wanted to be.